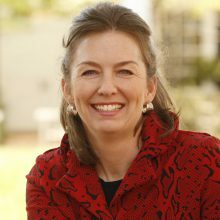 Mary Margaret Frank is an Associate Professor of Business Administration and Academic Director of the Institute for Business in Society at the University of Virginia Darden School of Business. Previously, she taught at the University of Chicago’s Graduate School of Business and received her PhD in accounting from the Kenan-Flagler Business School at the University of North Carolina at Chapel Hill. Frank’s interest in the intersection between the public and private sectors has evolved over time into a broader exploration of cross-sector engagement on societal issues in order to affect change. In order to best accomplish this broader objective, she has initiated a cross-disciplinary agenda at the University of Virginia including a seminar titled the National Debt, a course and pan-university student initiative to address HIV/AIDS, the creation of the P3 Impact Award to recognize outstanding global public-private partnerships, and the Tri-Sector Leadership Fellows program featuring business, law and public policy speakers and issues. These initiatives and her outstanding teaching, innovative curriculum design and leading research have led Frank and her students to receive accolades from leading political figures as well as numerous awards.